Recently, the IGNOU result of June 2018 examination has been declared by Indira Gandhi National Open University. Now, It’s the time for upcoming Dec 2018 term end examination. Many of the students who have taken admission in January or July session must be unaware of the process to apply for these examinations. Are you going to appear in December 2018 examination? If yes, then you should know the complete process to appear in the exam which includes filling of Ignou exam form, payment of application fee, checking of Ignou exam form submission status, start and last date to submit form,etc. 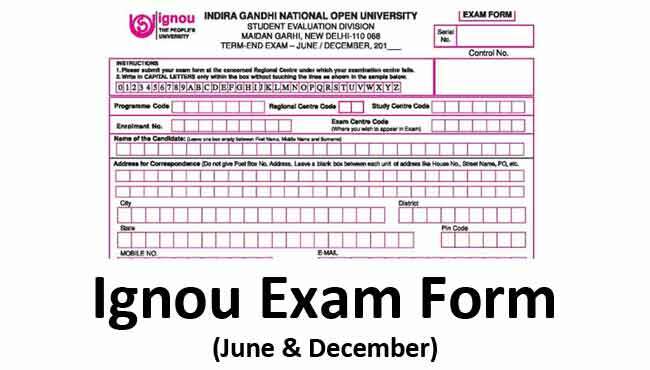 So, here I am going to tell you each and everything about examination conducted by Ignou. Students will be able to fill up exam form from 21st September 2018 and the last date to fill up exam form is 31st October 2018. After that students can still fill up form till 10th November but they have to pay late fee as prescribed by the university in its prospectus or on the website. Eligible students can fill up application form online by visiting the university official website at exam.ignou.ac.in. At this web page, students can check out complete guidelines and eligibility criteria to appear in the upcoming examination. The most common asked by newly enrolled students is “what is Ignou exam fees?” It is very easy to find the answer on the university official website as I mentioned above. But for the student’s convenience, I would like to tell that Ignou charges fee of Rs. 120/- per course as exam fee. Note: The Ignou term end examination is non-refundable in any case. If the students are filling up online examination form, then they can submit the exam fee online only. In case of submitting exam form by offline method, then the fee has to be paid through bank demand draft. The DD has to be made in favour of IGNOU, payable at the city of the Regional Center where the student will submit the examination form. Subscribe to our newsletter to receive more latest updates about Ignou online exam form submission.